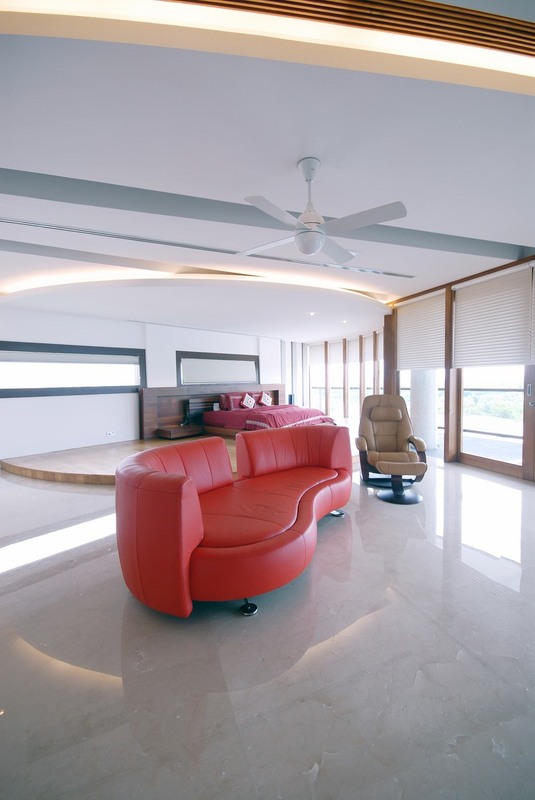 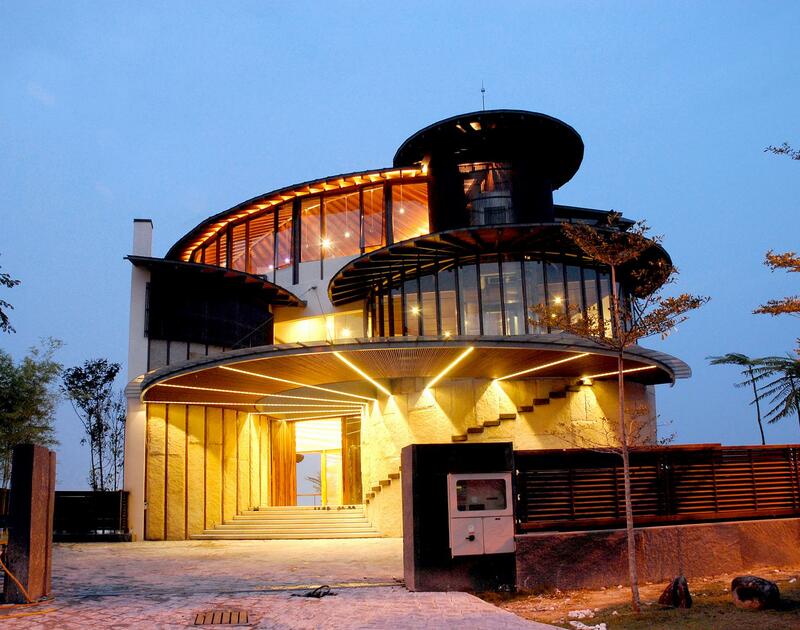 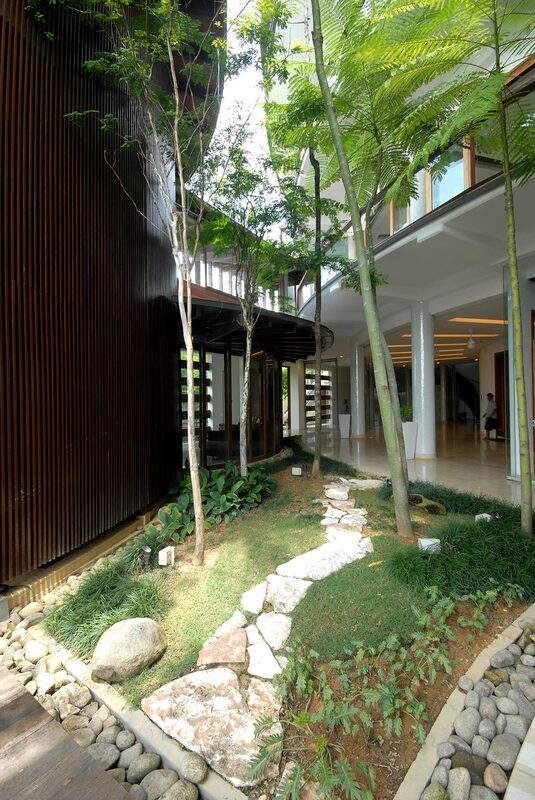 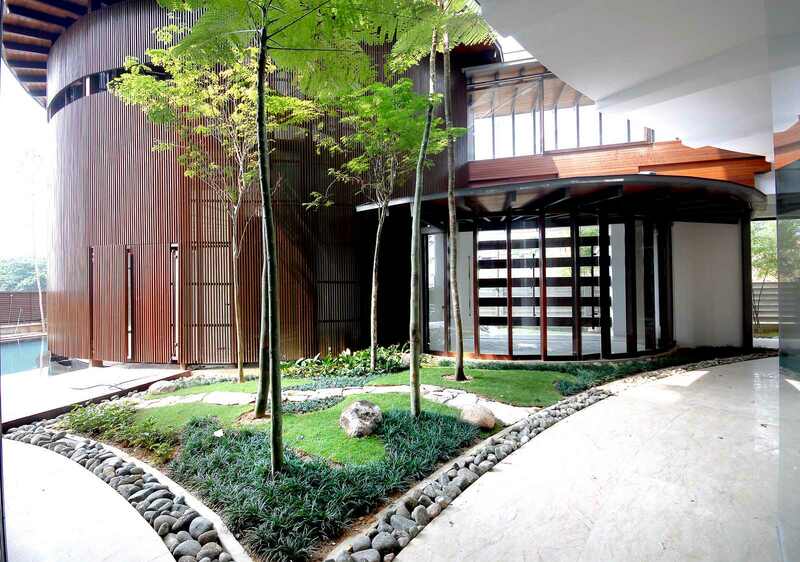 Located in a gated and guarded community in Shah Alam in the Malaysian State of Selangor, the house was designed by Wooi Lok Kuang of Wooi Architects. 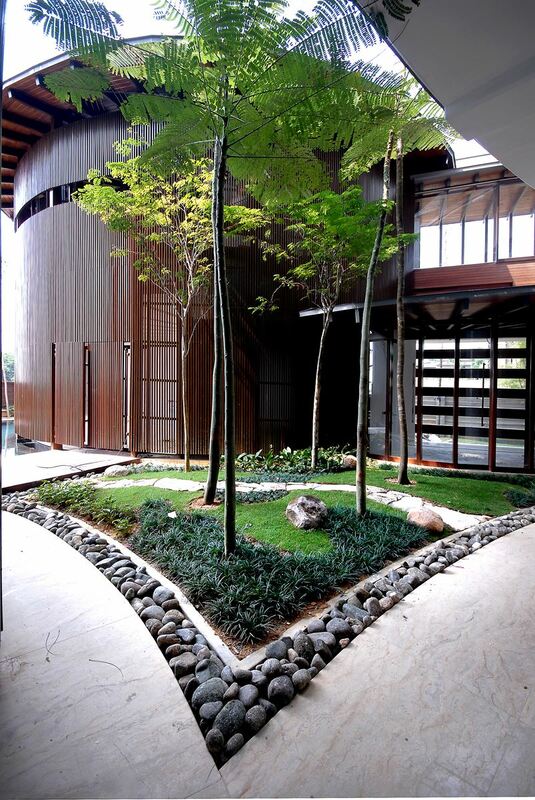 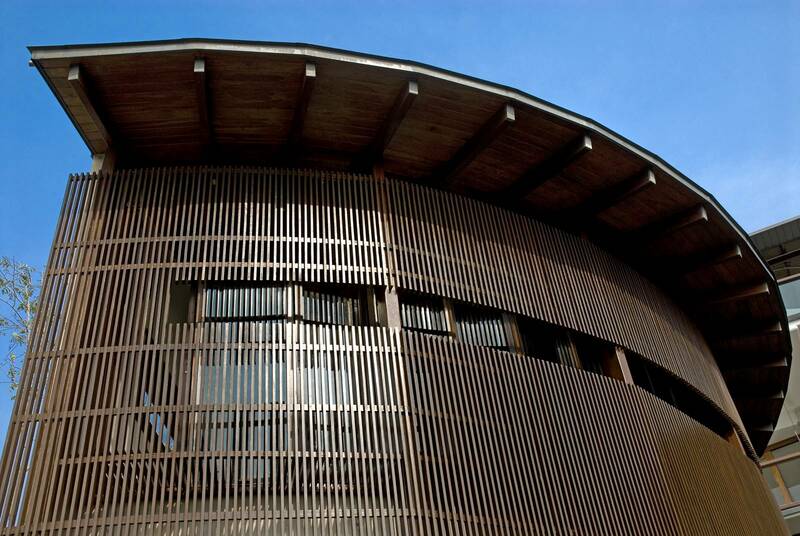 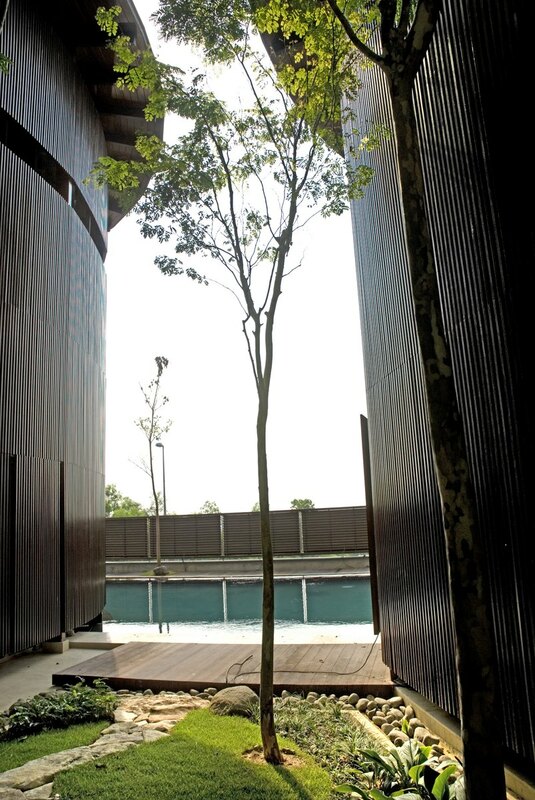 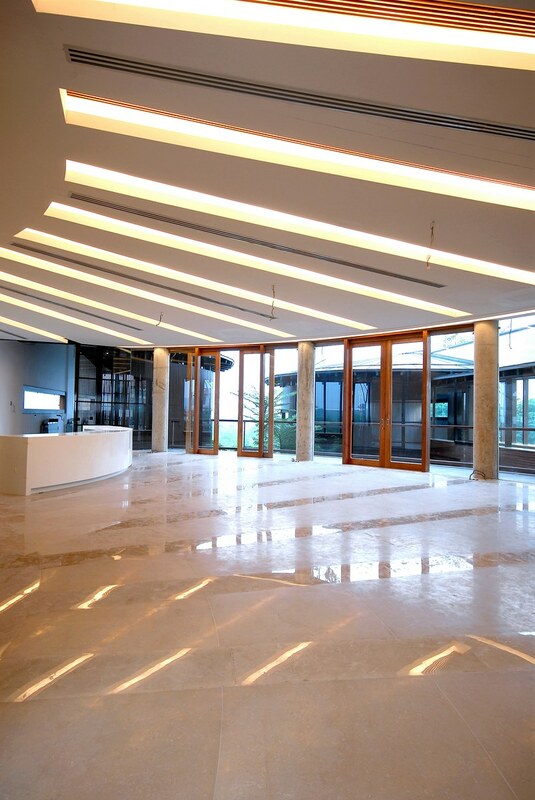 Wooi has incorporated natural materials such as wood, stone and granite in the design language. 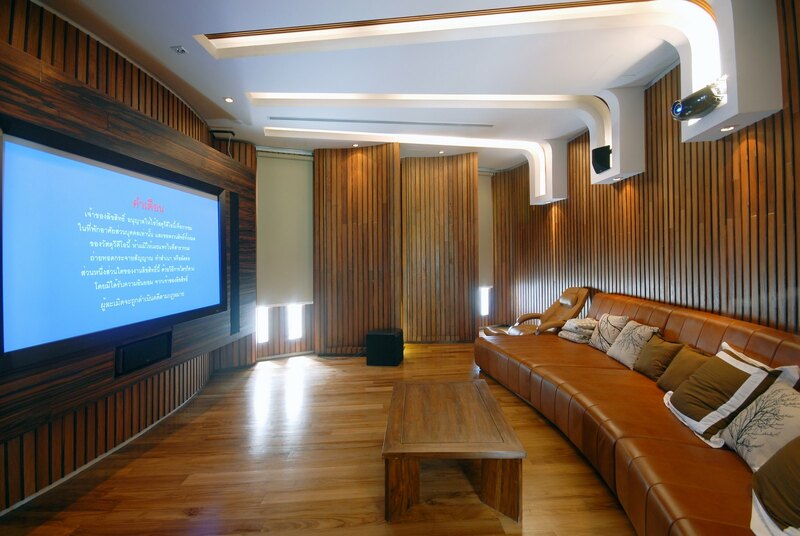 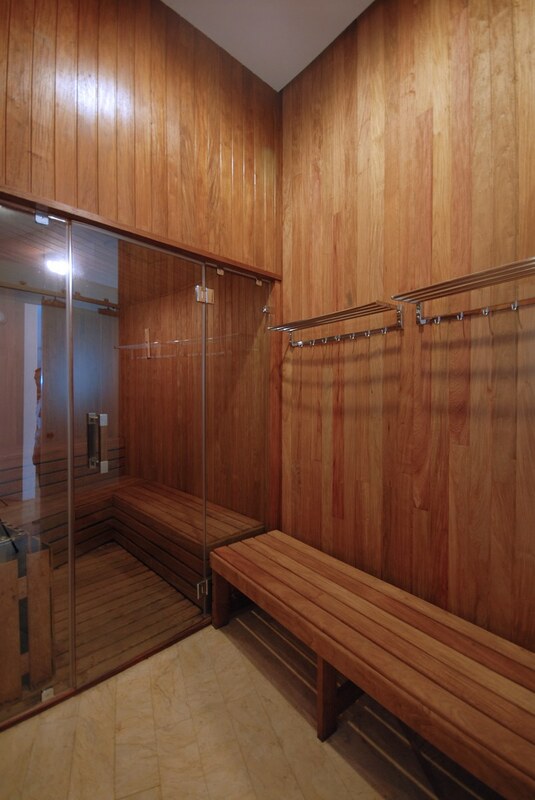 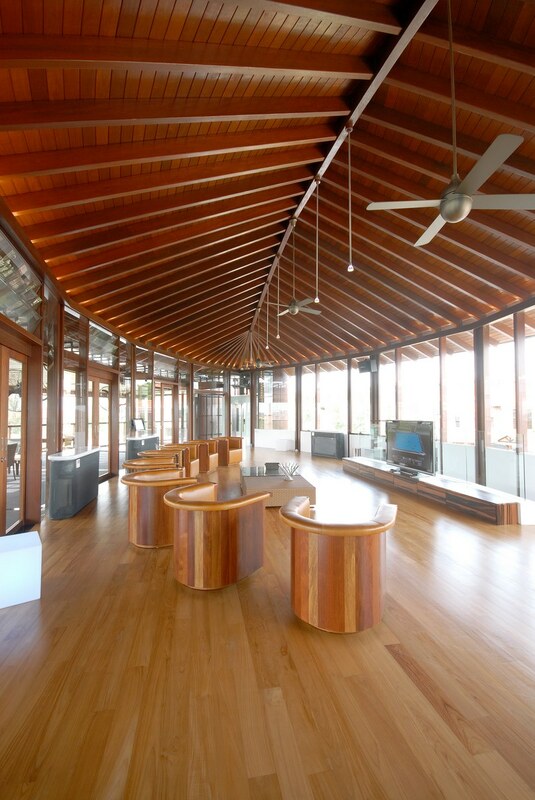 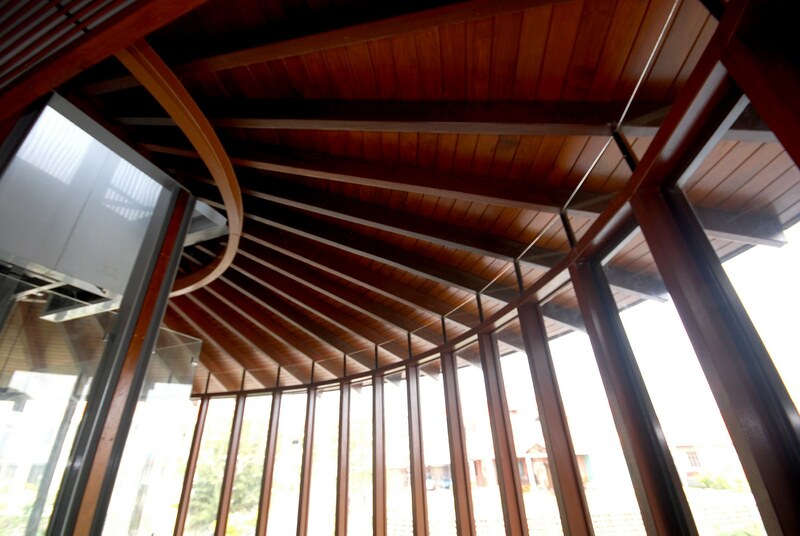 Timber, however, features prominently in the home’s structural and visual makeup and is used in load-bearing columns, partitions, struts, ceilings, flooring, inserts, frames and cabinetry. 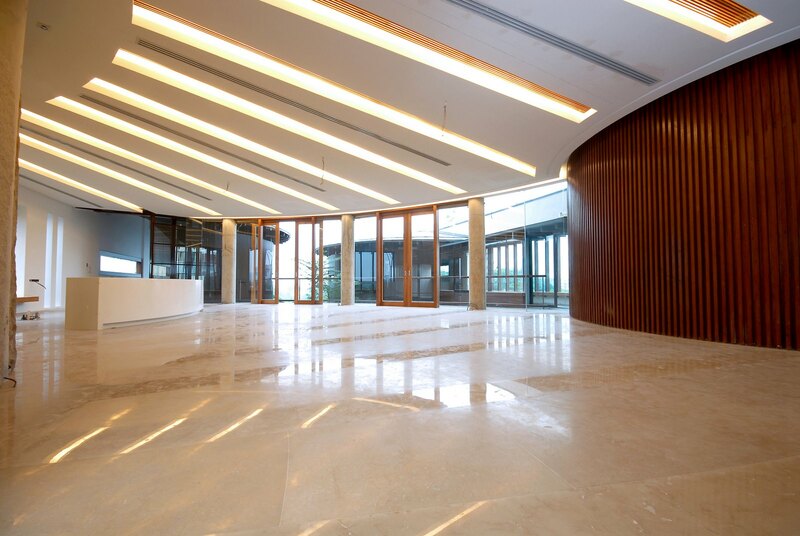 Floors are of marble and granite slabs while external walls are of stone. 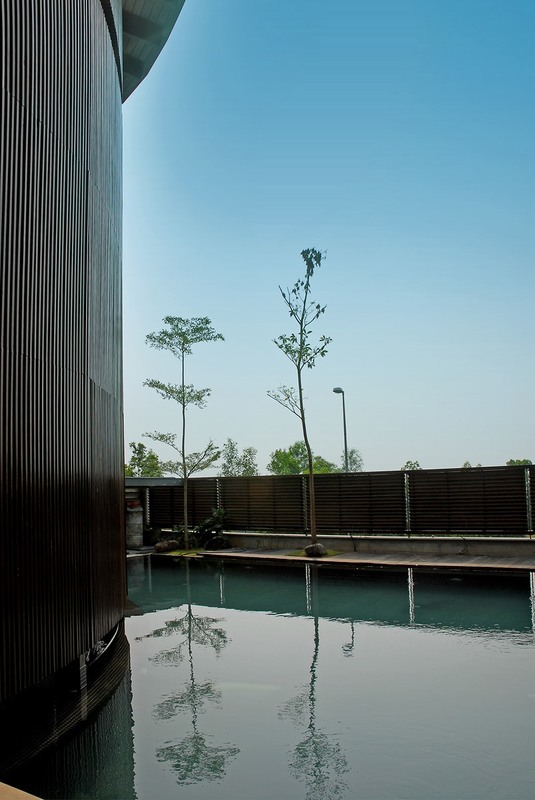 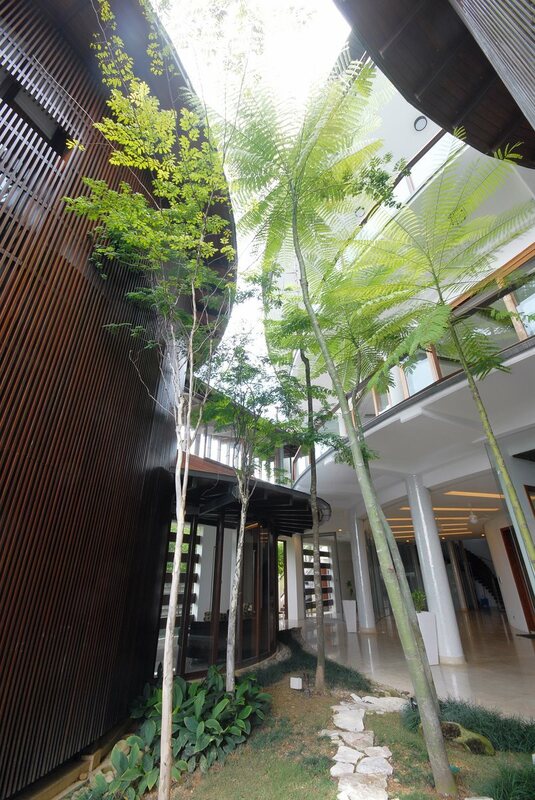 Sited on undulating land within the grounds of Sultan Salahuddin Abdul Aziz Shah Golf Club, the three-storey house inclusive of a loft, has expansive outdoor terraces to encourage the enjoyment of external spaces. 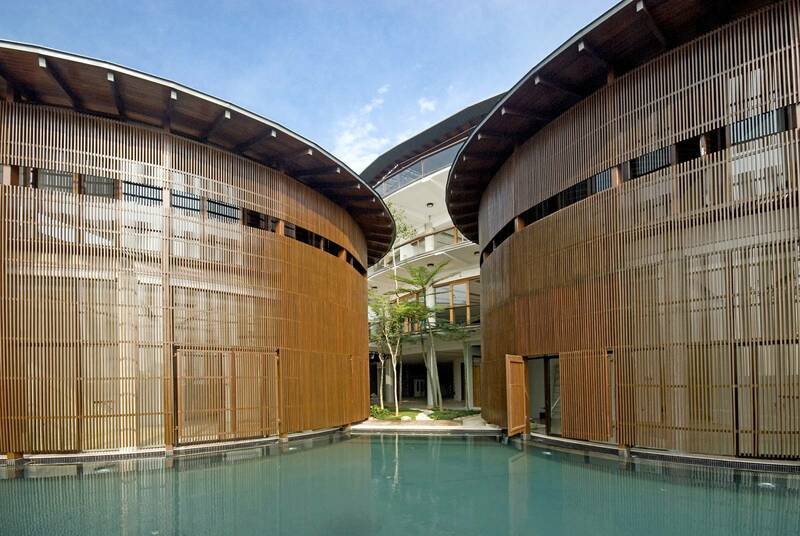 With a palatial built-up of 12,000 sq feet, the built-form hosts the main building and two half-moon cabanas, which when viewed from a certain angle, resemble a cluster of humungous drums. 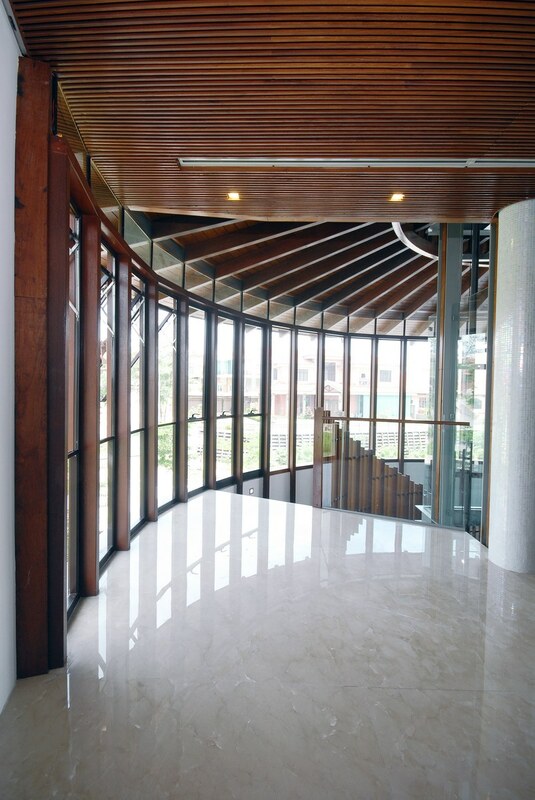 The sinuous curves of these structures give the impression that less on-site space has been used. 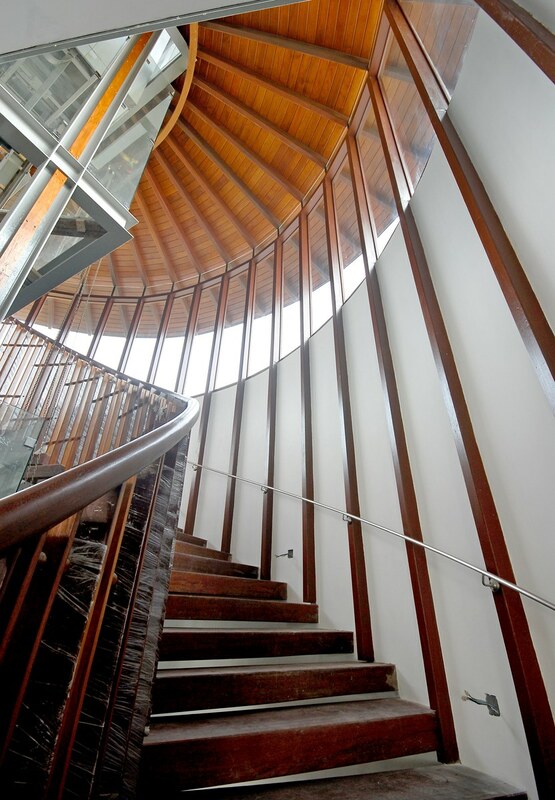 A journey through the house is a voyage of discovery that reveals an array of dramatic architectural details. 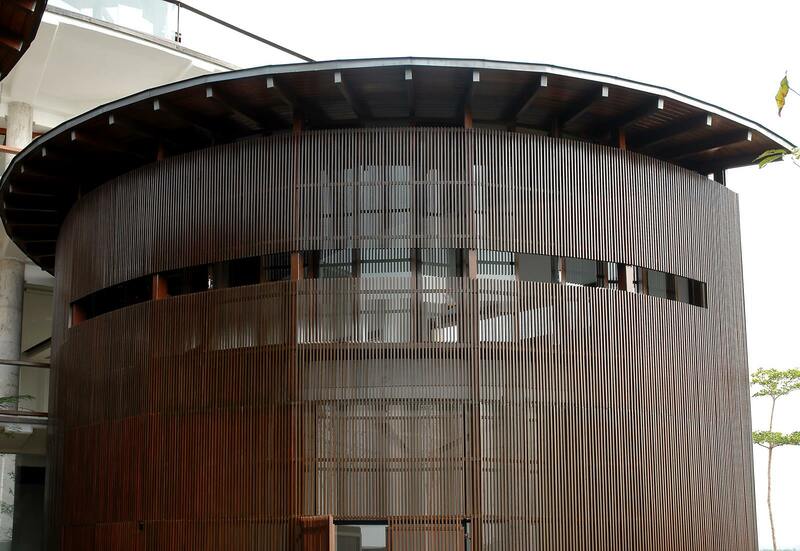 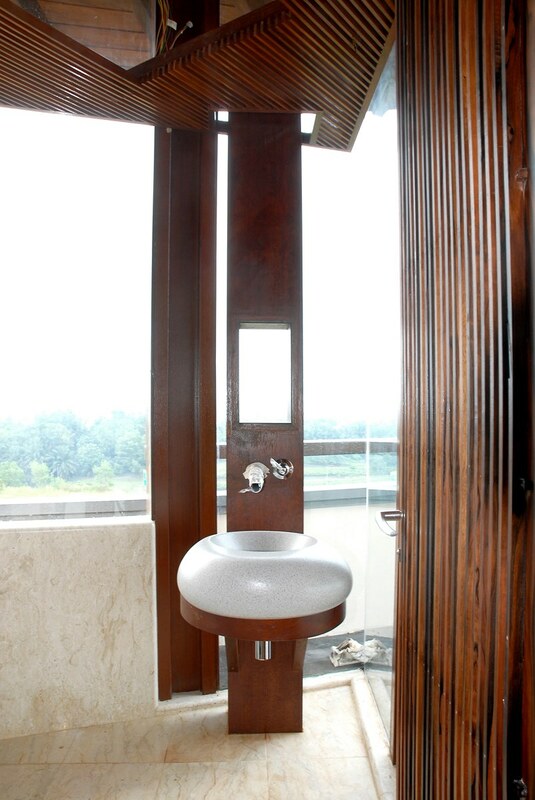 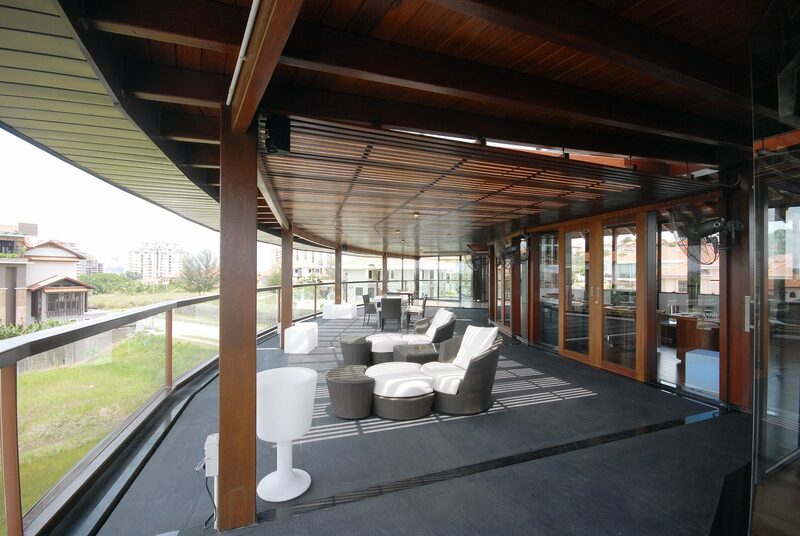 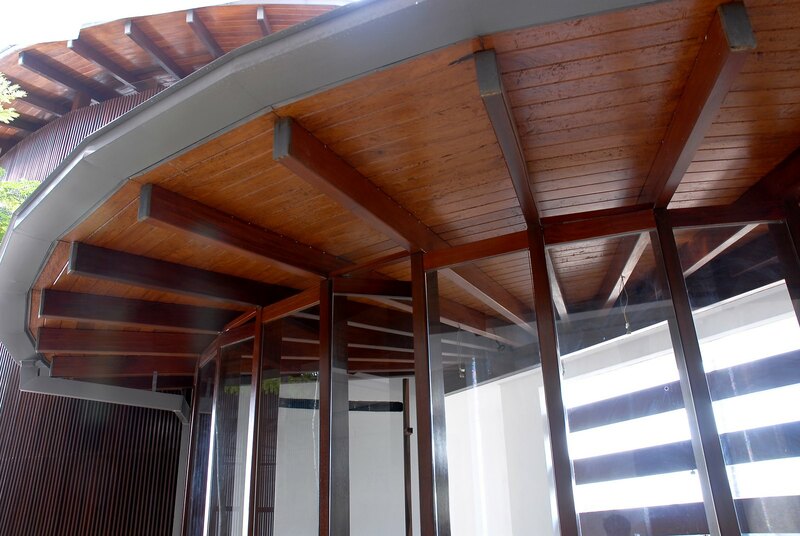 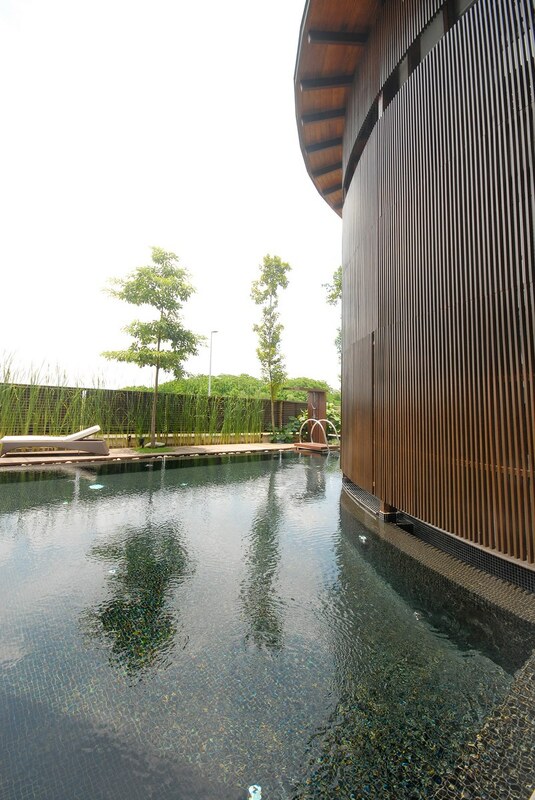 The vertical chengal strips symmetrically installed on the sides of the ‘drum’ cabanas conjure a spinning motion. 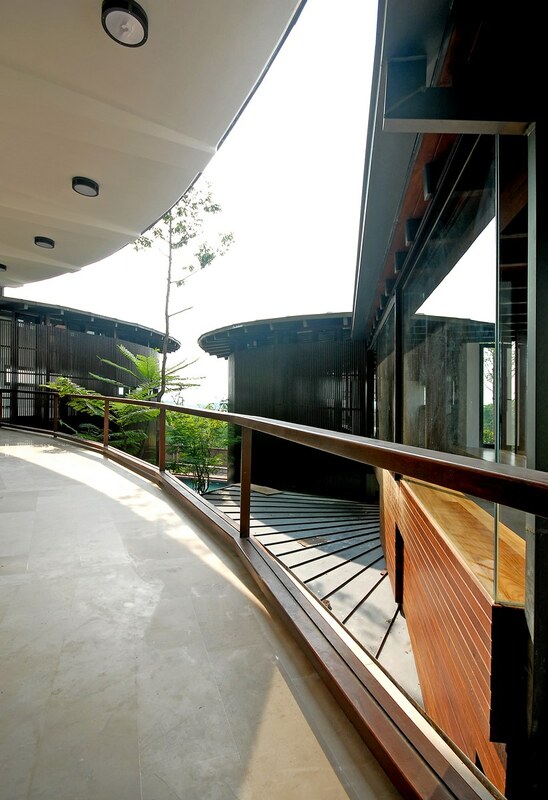 This, coupled with the sensuous circular roofs and the sweeping canopy, all work in unison to entice guests up the few stone steps through the ebony doors and into the house. 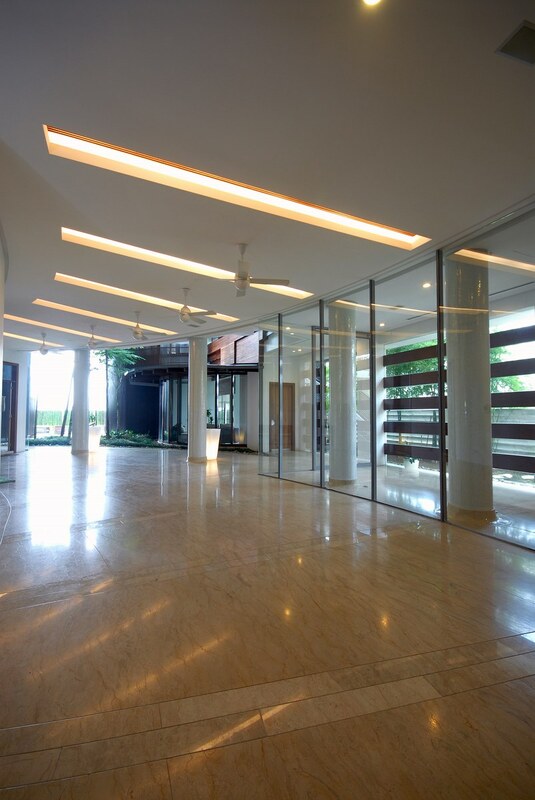 The 25 mm x 50 mm chengal strips filter the heat without compromising on the need to illuminate the interiors naturally. 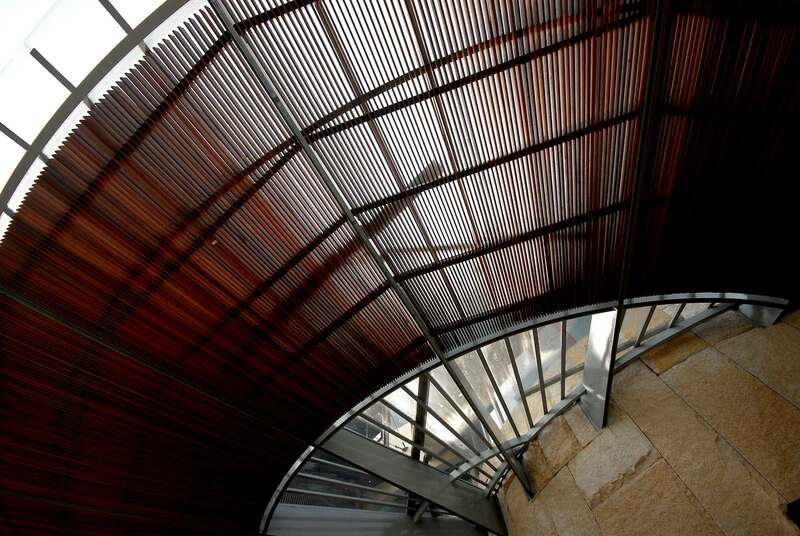 This also provides for beautiful symmetrical shadow plays when the sun shines upon the strips. 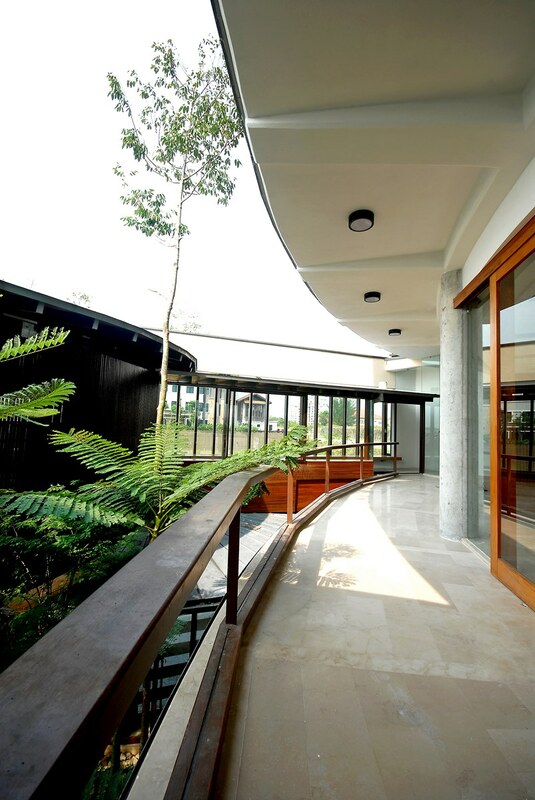 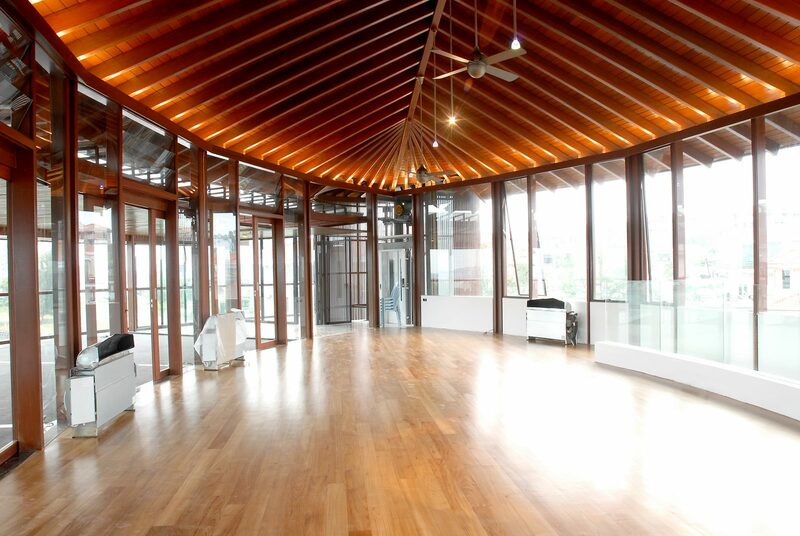 Full-height windows and doors facilitate natural ventilation to all rooms without exception. 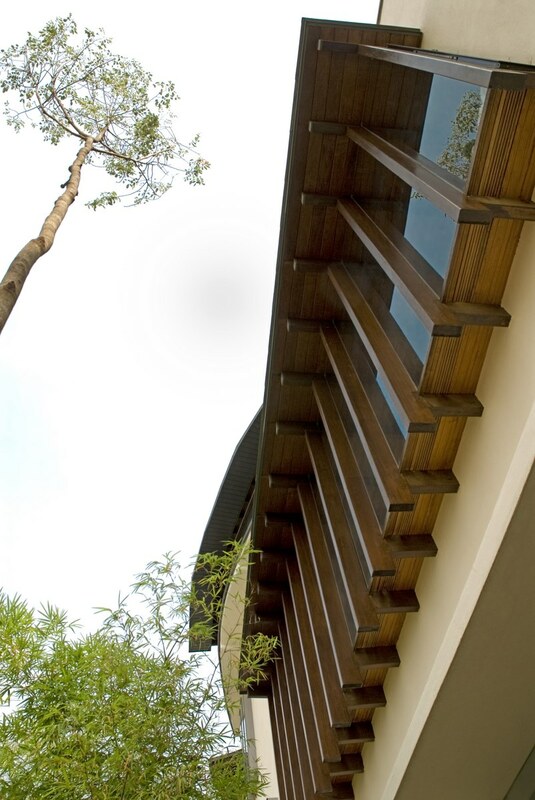 While the exterior of Lee’s Residence is mostly screened by stark vertical chengal strips, the interior spaces are defined by lighter-coloured timber in teak doors and windows, merbau rafters, yellow rosewood ceiling panels, and furniture in richly textured Ebony. 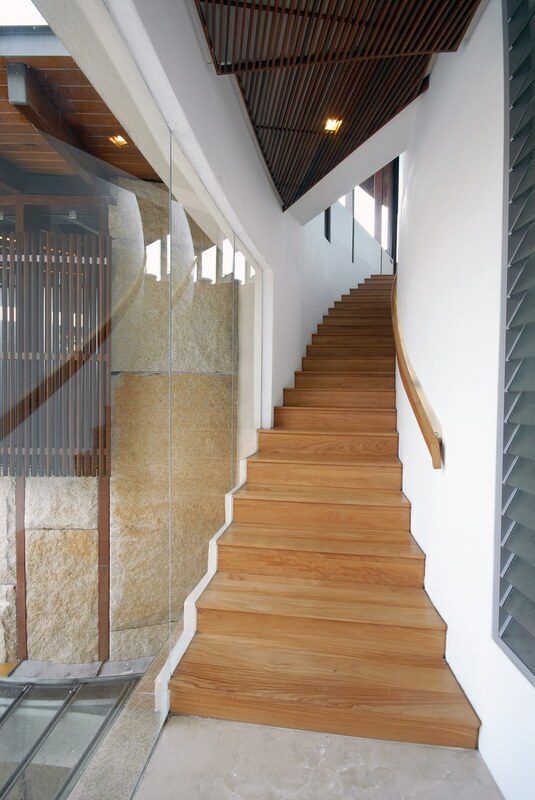 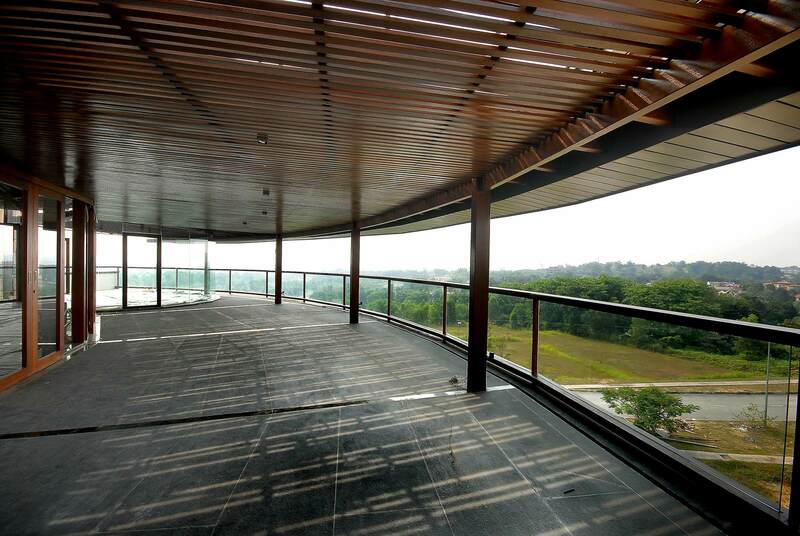 A stair of solid merbau timber logs cantilevered from the stone wall, spirals around the glass lift and leads one up to the top-most entertainment floor that affords 360-degree panoramic views of the vicinity and beyond. 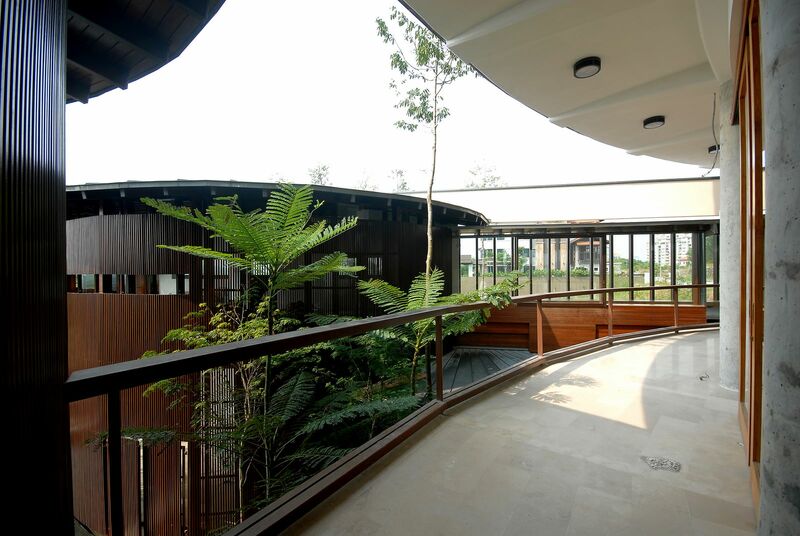 The space and volume, demarcated by curves rather than straight lines, separate and connect the interior, squeezing the views at certain angles only to expand them outwards while creating irregularly shaped gardens in between that allow sunlight to penetrate into the most hidden corners. 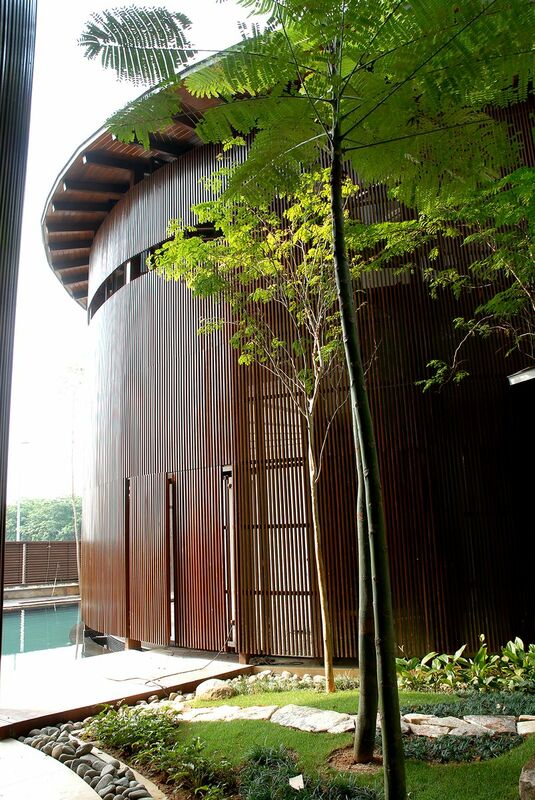 The geometry was intended to forge a tension between the curvilinear central garden and the fortress-like perimeter walls for a more dynamic and intriguing relationships between the inside and out. 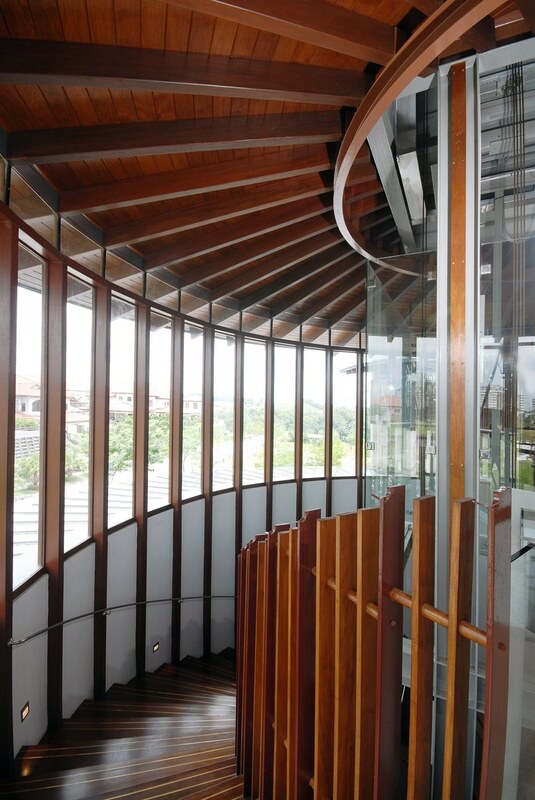 The curves also help to scale down the mass of the building on the outside while creating a sense of mystery and the experience of discovery on the inside. 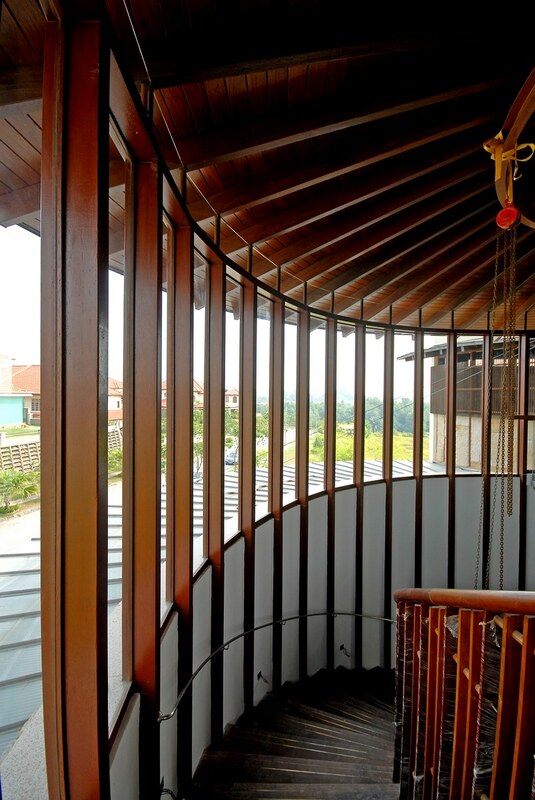 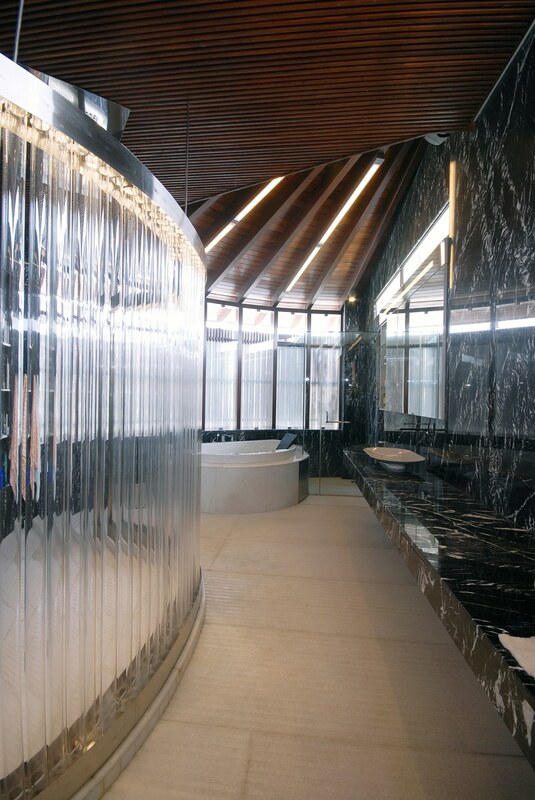 “I believe that curved forms provide a sense of mystery and create tension by unfolding spaces within spaces. 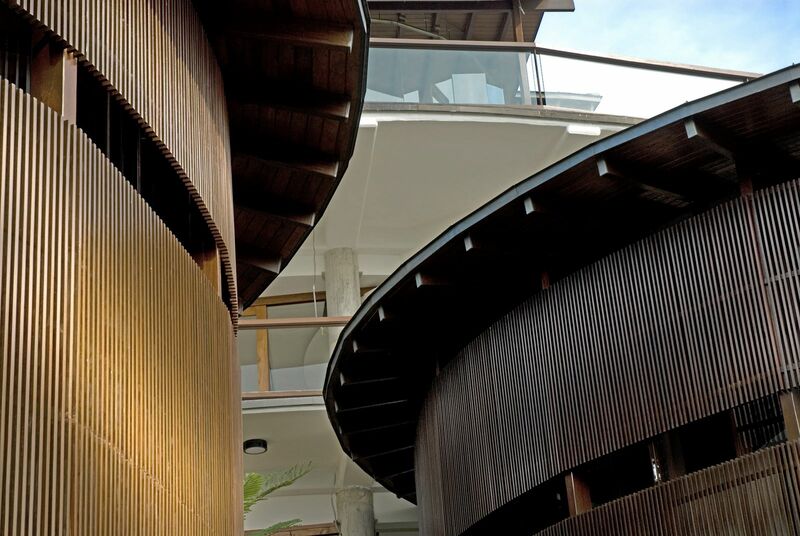 The fluidity that comes from curved walls redefines spatial norms and allows the vision to move seamlessly from one room to another,” says Wooi. 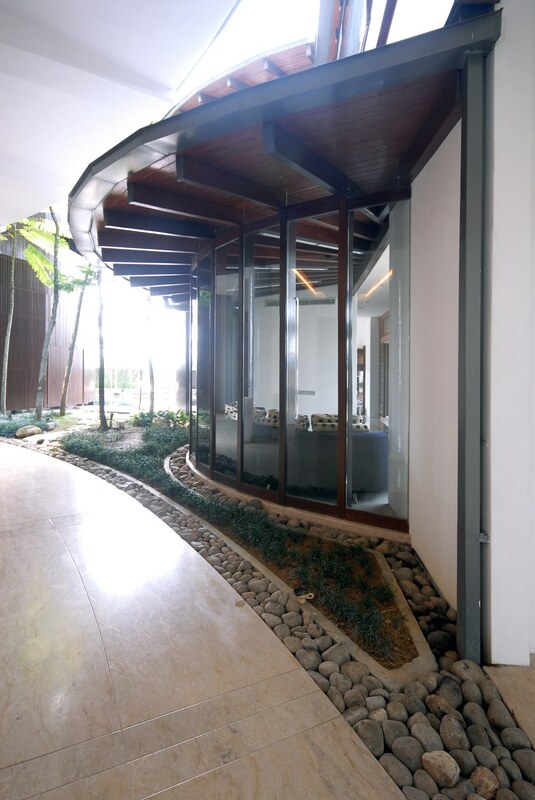 From the lounge, full-height glass doors offer tantalising glimpses of the garden and swimming pool, which are accessible from the lower ground floor. 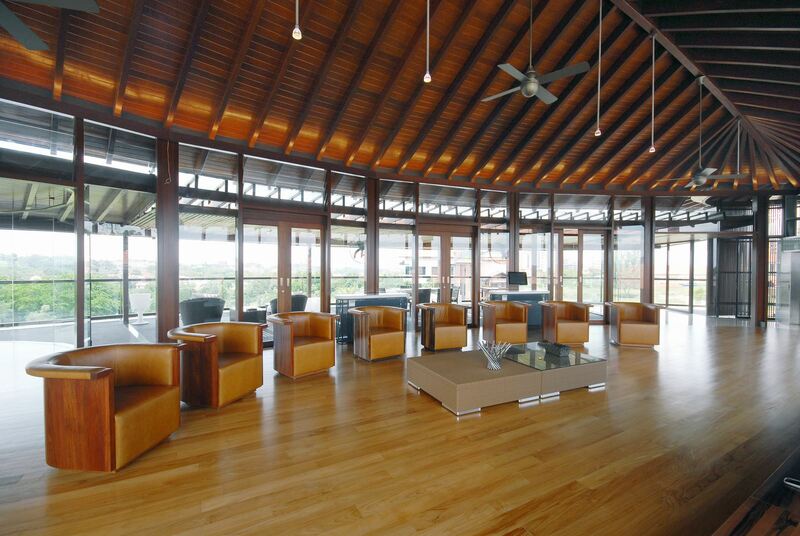 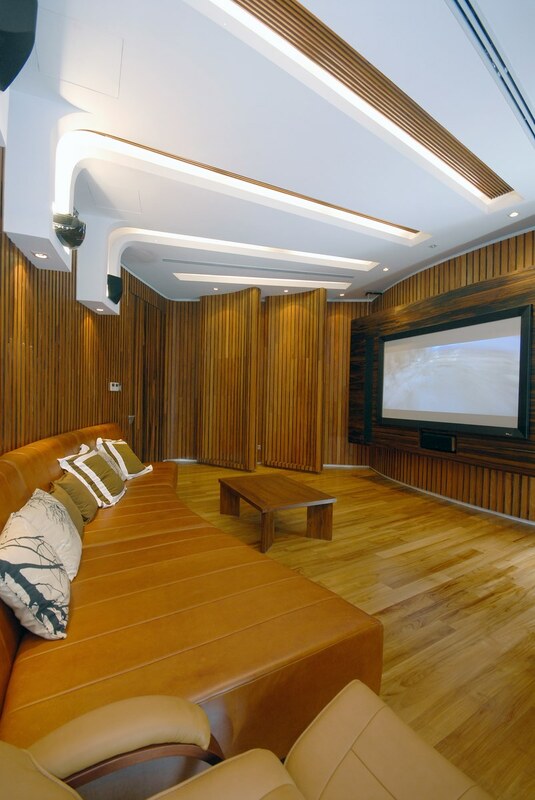 The lounge also affords views of the golf course and the twin ‘drum’ cabanas that house the sons’ sleeping quarters. 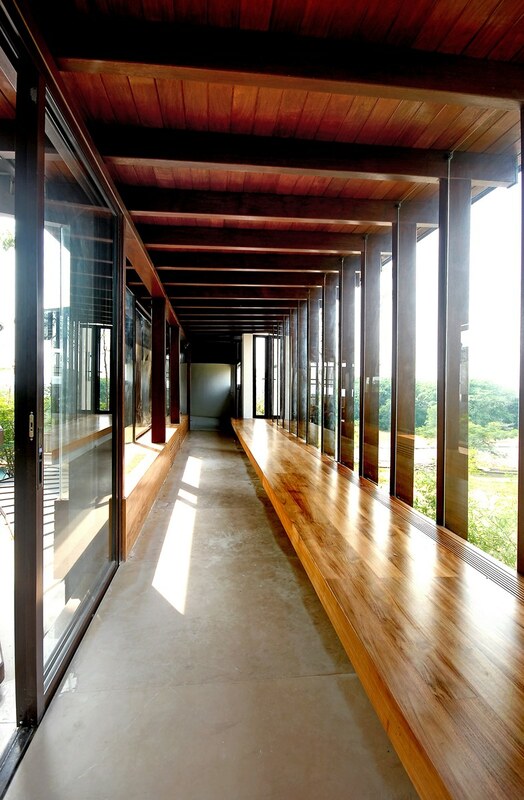 The view from within the house is deliberately controlled. 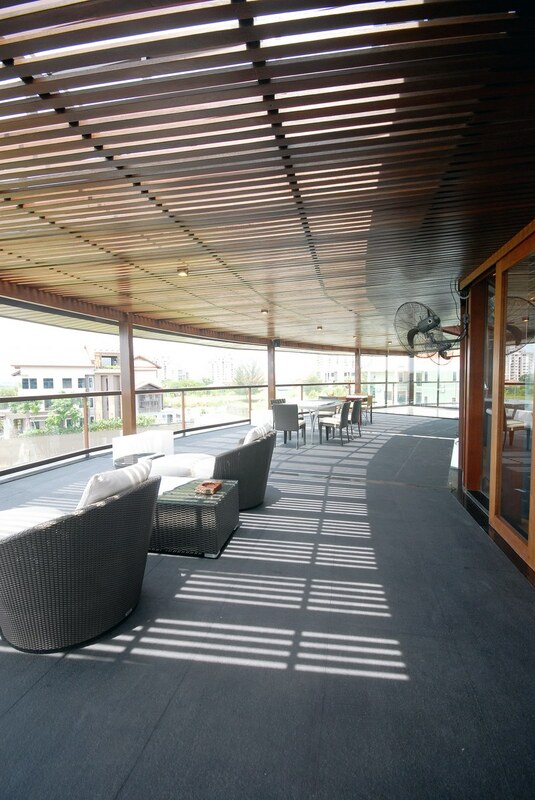 On the ground and lower ground floors, the view is limited and framed by the two cabanas. 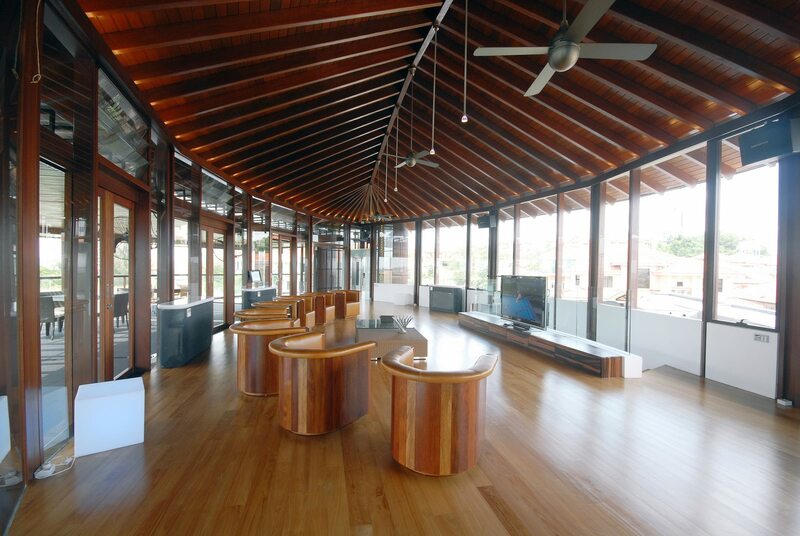 An 180-degree panoramic view is made exclusive to the master bedroom suite while a 360-degree panoramic view is reserved for the loft where family members and their guests congregate for line dancing and other social activities. 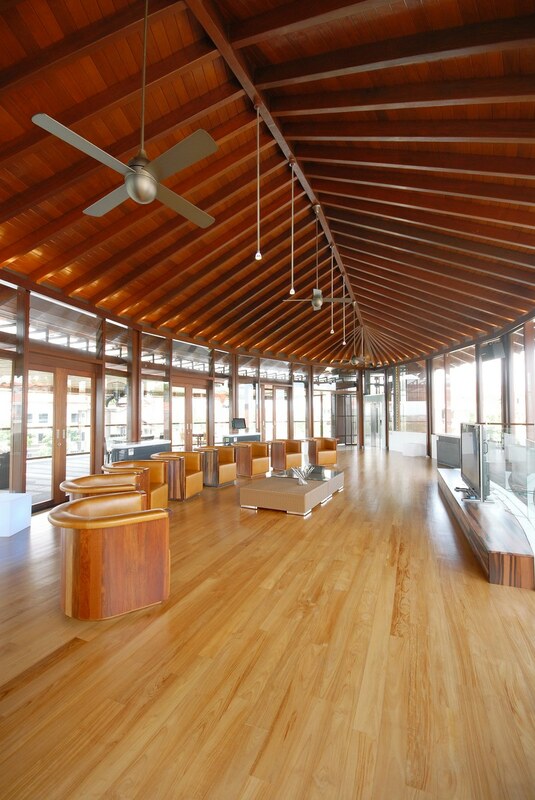 The leaf-shaped loft has full-height glass walls on either side. 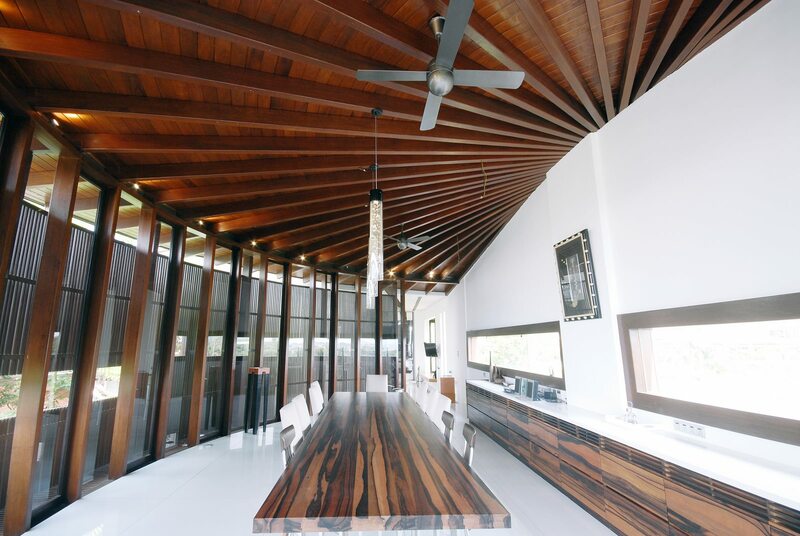 “The journey through the house is an experience in itself and I have adopted an approach that creates a sense of rhythm within the home’s setting; it is a journey that unfolds slowly layer by layer,” says Wooi. 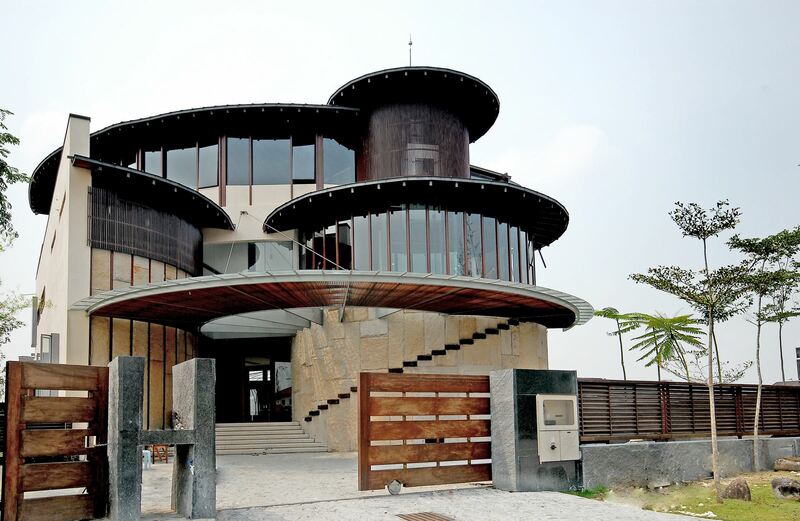 The highly creative detailing and architectural design of the house bear testimony to the architect’s boldness and ingenuity to move towards the unconventional.